1 of 3 Pat dry 4 skin-on salmon fillets (5 oz each) and season with 1/4 tsp salt and 1/8 tsp black pepper. In a saute pan, heat 1 tbsp extra-virgin olive oil over medium-high. Place salmon skin side up in pan; cook 3 minutes. Flip and cook 3 more minutes for medium. Cool slightly on a plate, then cover with plastic wrap and refrigerate until cold. 2 of 3 In a large bowl, whisk 2 tbsp extra-virgin olive oil, 2 tbsp lemon juice, 2 tsp lemon zest, 1 tsp Dijon mustard and 1/2 tsp salt. Remove salmon from fridge and flake into large pieces with a fork, discarding skin. 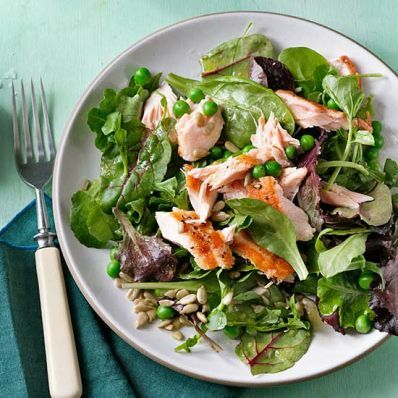 3 of 3 In a bowl, gently toss salmon with 10 oz thawed frozen peas, 6 cups watercress, 1 pkg (5 oz) mesclun and, if desired, 1/2 cup roasted and salted sunflower seeds.